The ms Swiss Corona is Riviera’s oldest cruise ship – but there’s still plenty to like about this classy beauty. 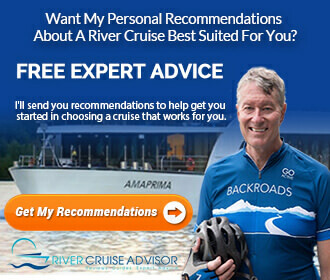 Photo courtesy of Riviera River Cruises. 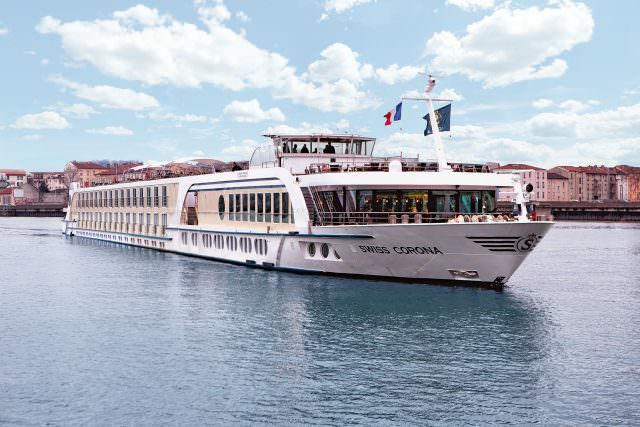 Launched in 2004, the 139-guest Swiss Corona is one of the older ships in the Riviera River Cruises fleet – but don’t let that put you off. Inside, she’s one of the warmest and coziest ships in the fleet, with plenty of highly-polished wood accents and a style that closely resembles a classic boutique European hotel. Brass fittings, wrought-iron staircases and elaborate glass wall lighting sconces add a nice touch to the vessel’s overall look and feel. 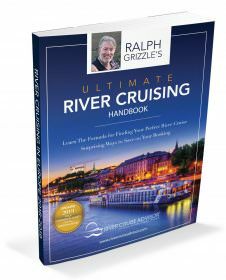 Sailing Riviera’s eight-day Burgundy, the River Rhone and Provence itinerary, the Swiss Corona offers plenty of old-world elegance on a very modern river cruise ship. Standard Staterooms aboard the ms Swiss Corona feature balconies on both Diamond and Ruby decks. Photo courtesy of Riviera River Cruises. Standard Cabins are located on Diamond, Ruby and Emerald decks and measure 161 square feet. Beautiful wood accents adorn these rooms, with faux wall fittings cut in soft, swooping angles that lends an artistic, almost Art Nouveau look to each room. Beds are available in either twin or queen configuration, and rooms feature a private bathroom, closet space, and flat-panel television set. Rooms on Diamond and Ruby decks feature French balconies, while Emerald Deck staterooms feature two small fixed windows. Select staterooms in this category are available for no additional supplement to solo travellers. Superior Suites and Superior Stern Suites are 193 square feet and are available across all decks. Essentially stretch versions of Standard Cabins, these rooms add more personal living space, including a small sitting area and slightly larger bathrooms. 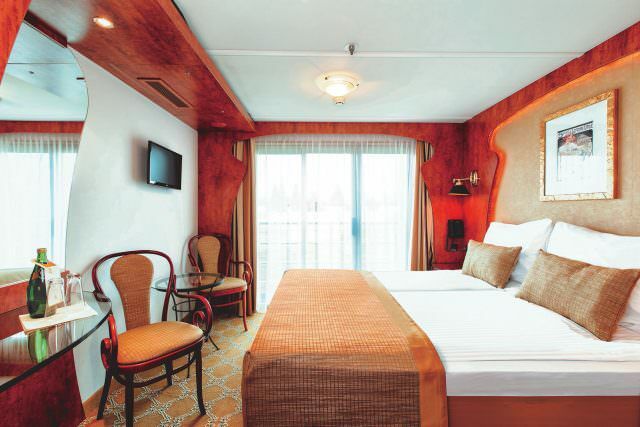 Like Standard Cabins, Superior Suites located on Emerald Deck have quarter-height, fixed windows, while those on Ruby and Diamond Decks have French Balconies. A separate “Superior Stern Suites” category is identical, but is located at the extreme end of Diamond Deck. The layout in these rooms varies slightly, owing to the angled walls bordering the aft-facing Lounge. 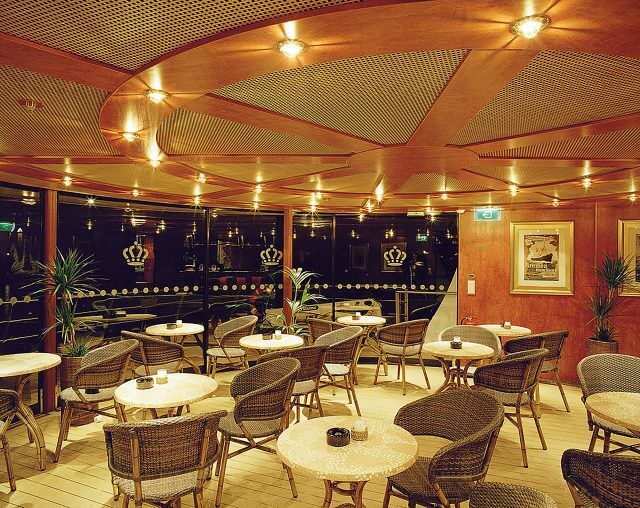 Public areas, like the ship’s main lounge, are charming and comfortable. Photo courtesy of Riviera River Cruises. 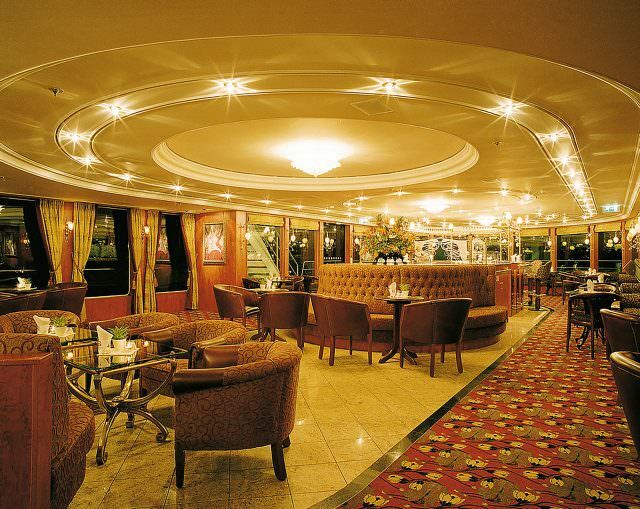 Public rooms aboard Swiss Corona have plenty of old world charm, with brass and polished wood accents at every turn. The color palette of each room leans towards reds, oranges and earth tones, and the ship’s main Restaurant is particularly attractive, with its rounded windows, wood panelling and wood ceiling accents, and glass relief panels. Full buffet breakfast and lunch are served in the main restaurant, which also hosts multi-course dinners in its elegant setting. Casual, lighter fare can be had in the Lido Bar and Restaurant located all the way aft on Diamond Deck. At night, the Lido Bar and Restaurant turns into a complimentary, reservations-required dining experience featuring a unique menu of specialties. The Lounge is the social hub of the ship, and provides great views of the river from its forward location. A full-service bar is located here, and Riviera River Cruises often brings on local entertainers to perform in the evening. The Lido Bar, all the way aft, serves as a secondary lounge. Photo courtesy of Riviera River Cruises. Adjacent, the ship’s Main Lobby hosts Reception and Tour desks, along with a small boutique and gift shop. Up top, a splash pool and putting green complement the outdoor seating on the Sun Deck, with both shaded and uncovered options available. Additionally, the Swiss Corona offers a small steam and sauna room for guests to use – a rarity among river cruise ships. There are no Deluxe Suites aboard the ms Swiss Corona.